The Chevrolet Spark is a mini car and the smallest car they ever sold. In the front area of the convention center, five Sparks were on display, four wrapped in art from different comic book companies and a green on to show what the regular Spark looked like. Each day, cards were given away to give attendees the change to win a Spark – and they could choose from one of the wrapped ones or a normal, unwrapped Spark. Additionally, a white Spark was on display in Artists’ Alley, where popular comic book artists were scheduled to draw on the car (which I unfortunately didn’t see because I never made it to Artists’ Alley), but since they did not want attendees drawing on the car itself, they put up white boards to let everyone express themselves around the Chevy Sparks. People attending the New York Comic Con were also given the chance to ride in the Chevy Sparks outside the convention center. Nearby on display was a cobranded NYCC Camaro that was being used for promotional events leading up to the convention itself. Of course, that wasn’t good enough for my friend Rob, who also spends time learning to be a sideshow performer in Coney Island. 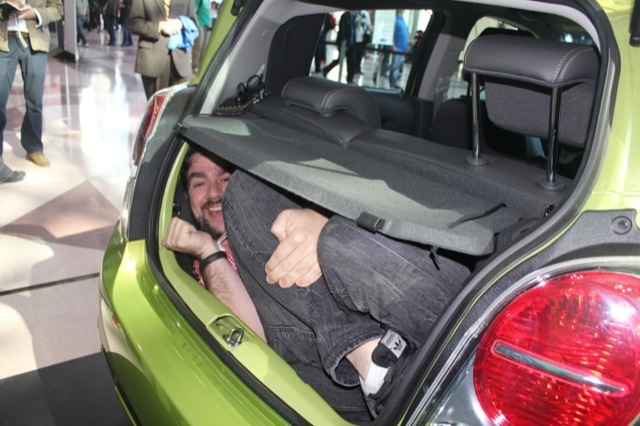 So, with permission from Chevy representatives, we needed to see if Rob could fit in the trunk of Chevrolet’s smallest car ever sold. It took two attempts, but he was able to replicate the feat he previously performed in a Chevy Sonic and fit into the small trunk. Chevy also was represented on the main floor with a full assortment of their latest vehicles. Most notably was the Transformers edition Camaro, which was black and yellow like Bumblebee in the Transformers movie and had the Autobot logo on the sides and hubcaps. Occasionally during the convention, a large Bumblebee costume was walked to the Chevy area and was there for photo ops for attendees and to bring attention to the Camaro. 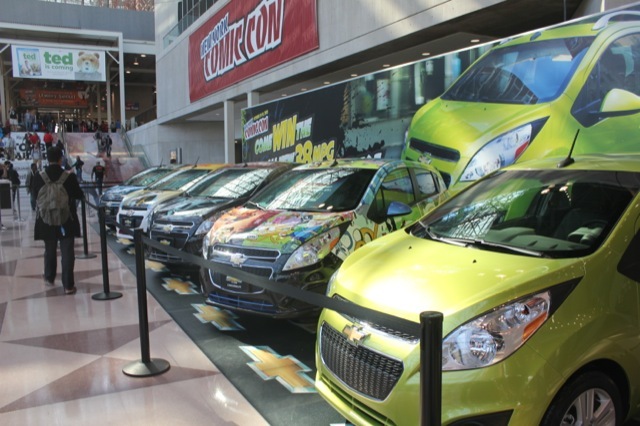 For the second year, Chevrolet brought their automobiles to the New York Comic Con and they were well received. It will be interesting to see what they bring to NYCC next year to the comic book going public.